Calgary to Beijing, China - $439 CAD roundtrip including taxes | new record! 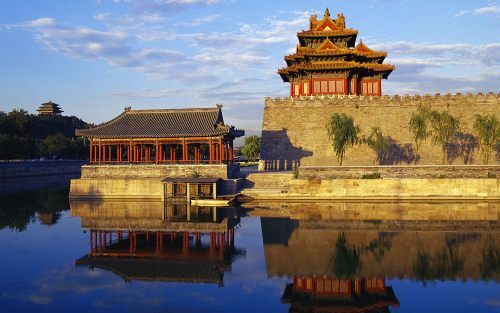 Air China has dropped the price of their 1-stop flights from Calgary to Beijing, China down to $577 CAD roundtrip including taxes. - first half of December (can return as late as December 14th, not past that). 2. Once the Kayak search completes, click on the date box to open up the calendar, and try other dates. Look for the dates that are $589 CAD roundtrip. Try the same dates you found on Kayak. 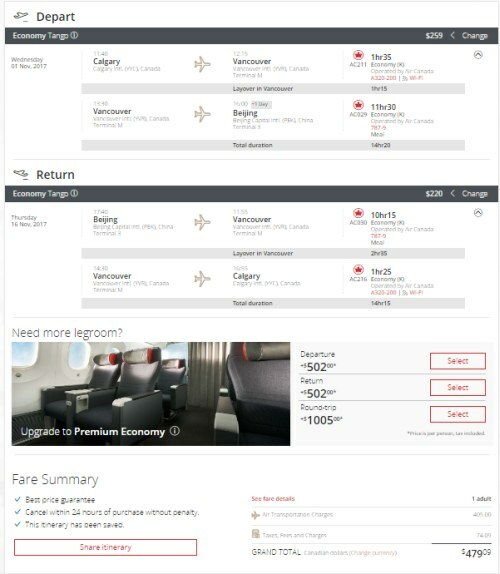 Update 7/14 - The Air Canada website is now showing fares from Calgary to Beijing, China for $439 CAD roundtrip including taxes! - the first half of December (can return as late as December 13th, not past that). Many other date ranges throughout 2017 and 2018 are priced at $547 CAD roundtrip. calgary, yyc, flight deals, air canada, asia, east asia, china, beijing, pek and air china. 10 Responses to "Calgary to Beijing, China - $439 CAD roundtrip including taxes | new record!" Hi Chris, this is an awesome deal. 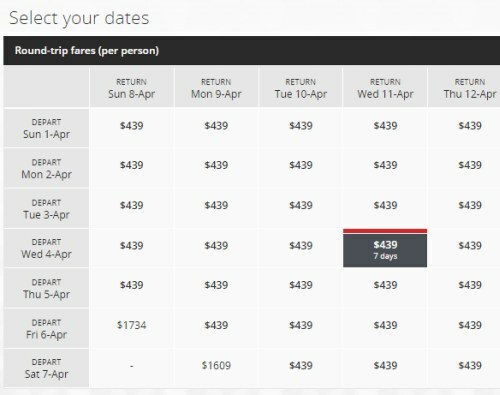 I tried a search from the other direction PEK to YYC on the same dates on Air Canada, but the price is over $700. I have friends who live in China and thought maybe they can take advantage of the same deal. Why is the price so different? Hi Pam, the airlines usually base their prices on the demand from each origin. One theory for why there has been so many unusually low prices to China in the last few years is that there is growth in the number of Chinese visitors wanting to come visit North America. And there are also now so many airlines flying in/out of Vancouver to satiate this demand. The airlines need to offer substantially lower prices for the flights originating in North America, since the demand isn't as strong originating *from* North America to China as it is from China to North America. Thanks Chris. Booked for April next year. I can’t believe I am paying sub $500, in fact less than $465 to fly from Calgary to China! It's definitely an incredible price, usually $465 roundtrip from Calgary gets you about as far as Toronto. Occasionally Hawaii if you're lucky. Beijing is 3700km further than Honolulu! Have a great trip! Thanks Chris! I booked our family of 5 over March Break next year (late March to early April) and there were plenty of options on Air Canada for $439 return, including all taxes! $238 on the way there and $201 on the way home. With one stop in Vancouver! Incredible! Booked YYC to PEK for me and my daughter over spring break 2018. $439 fares are selling out fast so we are coming back a couple of days later than originally planned to get the best fare....Thanks big time for the heads up!! Thanks Chris. We booked for late March and into mid April. This is an amazing price. Our first time to China....should be quite an experience! This site has been the source of some incredible flight deals. My pocket book is lighter but the experiences will be for a lifetime. Nabs, Gerard and Ron, have a great time in China! Thank You Chris for reporting this wonderful seat sale, we have book 4 tickets and plan on seeing China Easter Weekend with the family and friends. Message above from GERARD > Did you book a ticket for your Daughter? No problem Grace, glad it helped!